Reality is not what it appears — the ancients knew it, pioneering physicists of the early 2Oth century knew it, and current leading edge scientists are proving it — all is mind. Throughout the ages, Mankind has been trying to answer the big questions — What is the nature of existence and reality, what are we, and why are we here? In our current age, with the ascendance of the ideology of scientific materialism, we have a strong tendency to reject anything that doesn’t fit our materialistic paradigm and label it as “mystical”. We have become mesmerized by the material world. Materialism and consumerism run rampant in our society. Lured by the apparent success of the reductionist method that we have used to analyze and understand our world, we have come to view the universe as purely a physical system, working something like a great machine, and with matter being the fundamental substance of reality. Our scientific analytical methods have certainly been successful and have led us to understand the inner workings of matter well enough to create many useful technologies. But these successes have erroneously led us to conclude that our materialistic view of the universe must be correct and reject other ideas as “mystical” and backward. The materialistic paradigm persists in the popular and scientific thought despite plenty of evidence that it is indeed not true. The Theory of Relativity and Quantum Physics have both shown that energy is more fundamental than matter. The pioneers of quantum physics in the early 20th century — Max Planck, Albert Einstein, and others — all came to the same conclusion — that everything is energy and that somehow consciousness is intimately intertwined with it. And yet this insight seems to have been lost since then. Physicists are still chasing the fundamental “particle”, and focusing on material phenomena rather than focusing on what energy is, how it forms matter, and what other forms can it take. And modern science is still largely ignoring the role of consciousness, despite the observations of quantum phenomena that strongly suggest that consciousness is intimately related to the nature of reality. Mainstream science continues to assume that reality is objective, EG; that it exists independent of the consciousness of the observer despite much evidence to the contrary, and the conclusions of many pioneers of physics. The accomplished English physicist, astronomer and mathematician, Sir James Jeans, had this to say — “I incline to the idealistic theory that consciousness is fundamental, and that the material universe is derivative from consciousness, not consciousness from the material universe… In general the universe seems to me to be nearer to a great thought than to a great machine. 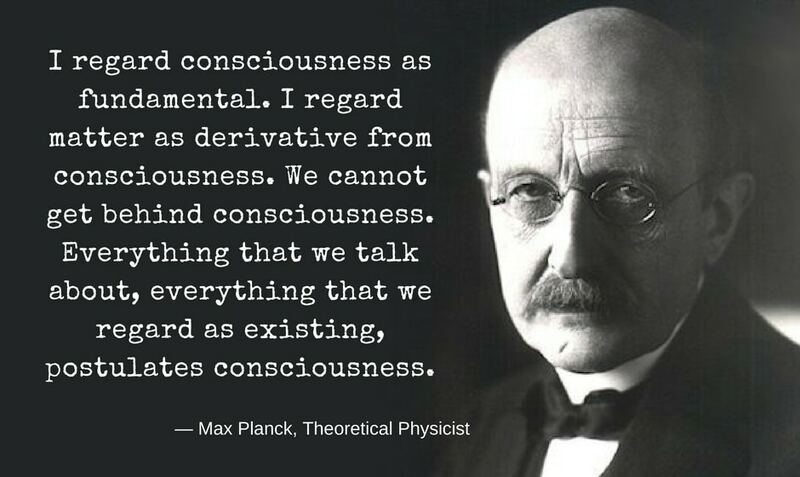 It may well be, it seems to me, that each individual consciousness ought to be compared to a brain-cell in a universal mind.” And he wasn’t alone, below Max Plank shares a similar viewpoint. Consciousness is probably the most mysterious and significant phenomena in the universe, so to treat it as irrelevant to understanding reality is a major mistake. In fact, there have been some very profound experiments (see this video about these experiments) that leave very little doubt that there is an intimate relationship between consciousness and reality. Leading some to conclude that consciousness is the fundamental substance of the universe, as many esoteric and mystical philosophies throughout the ages have claimed in one way or another. It’s not surprising that we might get stuck on the idea that matter is the fundamental substance of reality because this idea is just a natural consequence of our perceptual limitations. Our sensory apparatus — sight, hearing, smell, touch — provide us a useful representation of the external world, but when it comes to our primary sensory channel, vision, it is well known that we are “seeing” only are very narrow band of energies. Our eyes detect electromagnetic energy frequencies and convert them to the images and colors that we perceive. But our eyes only detect an extremely small portion of those frequencies, less than 0.00018%. And we are only “seeing” the clumps of energy condensed to a slow vibration (EG; matter). We can’t see all the rest of the energy and how everything is interconnected patterns of energy. Despite the lesson that the unseen phenomena of electromagnetic radiation should be teaching us we are still largely unaware of how the limitations of our sensory apparatus have conditioned our models of reality. There are many more unseen phenomena we have yet to detect and understand. Our visual perceptions are far less complete than we have ever imagined, and this has led to a tenacious conceptual bias that has colored our models of reality. This bias is interfering with formulating a broader, deeper more accurate model including tackling the big question we’ve been avoiding — what is consciousness and how it is related to reality. Long before our current scientific age, and for much longer, there were many cultures with a vastly different view of the cosmos. They saw the universe as intelligent and alive in it’s very fabric; they thought of the cosmos as a great mind, and that our earthly reality was in some sense a grand illusion. Philosophy continues to explore the nature of reality and consciousness and debate many alternate perspectives. Amongst contemporary schools of thought, there are those that resonant with the ancient idea that “all is mind”. This idea has not been lost completely. Science was born from philosophy but it has long since gone its separate way — science focusing on how things work and FACTS and philosophy focusing on MEANING. This is why humanity has lost its heart and it’s soul — facts without meaning are like a ship without a rudder. Modern science would have us believe that life, consciousness, and intelligence somehow emerged from the mechanizations of the universe by random chance, however improbable. That they were essentially accidents, and hence have no deeper meaning. Yet there are those who believe that it is all deeply meaningful and by design, and hence purposeful. Modern science is beginning to embrace that all is energy and is moving towards a unified energetic field theory, but they still have no clue how deep the rabbit hole goes. When they figure out the deeper intricacies of atomic energetics and molecular and bio-molecular energetics amazing advancements in technologies will be possible. And as this unfolds they will begin to realize that consciousness is a process in the energetic field and we will finally bid farewell to the materialistic view of reality that’s has dominated our thinking for so long. Exactly how consciousness could emerge in the energetic field is unclear but a branch of information and computational theory may ultimately have the answer. Cellular Automata Theory claims that highly complex and organized patterns and dynamics can emerge from very simple systems containing discrete cells, with a small sets of states, and rules that govern how nearby cells are affected. And this structure has an interesting similarity to the base predicates of a number of obscure but compelling unified field theories (Zero Point Field Theory, Reciprocal System Theory, and others). Presumably one of these complex dynamical patterns is the process of consciousness itself — the omni-present intelligence and awareness that permeates the energetic field, the fabric of the universe. 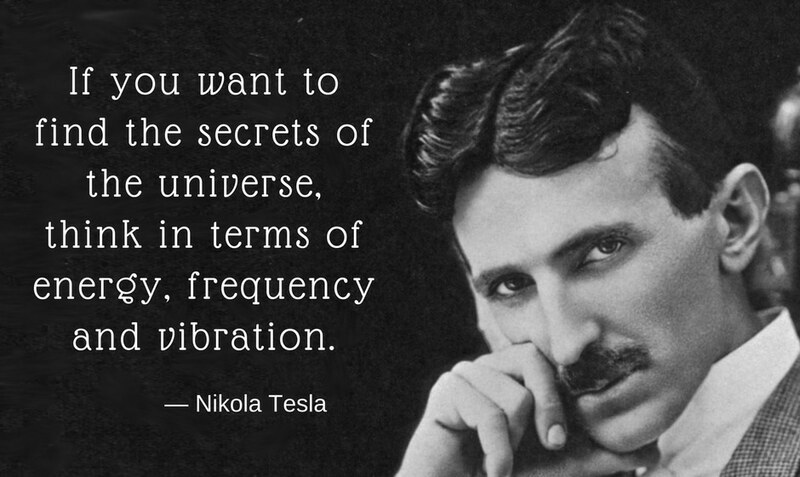 For a very interesting account of the scientific discoveries that have been unfolding over the past twenty years or so related to the energetic field and it’s connections with consciousness check the book The Field: The Quest for the Secret Force of the Universe. There are a number of groups doing scientific study of consciousness related physical phenomena and their findings are very interesting. Explore these organizations and their work to dive deeper into this subject; the Princeton Engineering Anomalies Research Laboratory, the International Consciousness Research Laboratories, the Global Consciousness Project, and the Institute of Noetic Sciences. An effort related to the Global Consciousness Project that is about to be launched is the Global Consciousness App. Check out the video below about this interesting App and project. According to Guy Needler, in his book The History of God, consciousness emerged in a small part of the universal energetic field and gradually increased in awareness until it was fully sentient. At that point it decided to explore what it was by experimenting with what it could do. It quickly realized that its thoughts created energy patterns in the field that it existed in. It also discovered that it could divide its consciousness and focal point of awareness into many smaller parts and perceive from many different perspectives at the same time. We are each a one of these divisions. We are all threads of the universal consciousness, and it is experiencing everything we are experiencing. In the universal mind thoughts are patterns of energy, and these patterns of energy are everything we see — light, matter, galaxies, stars, planets — and everything we can’t see. And there’s a lot more going on in the part that we can’t see than most of us imagine. The space that we think of as the one Universe, and with one reality actually holds many parallel realities, which are often referred to as the dimensions or planes of reality. Because source consciousness is creating all that is with it thoughts and each of us is a thread of source consciousness, our thoughts are also creative. We don’t realize this because we have forgotten what we are, but we are creating our reality with our thoughts, on an individual and collective basis, all the time. This is not obvious because our thoughts are erratic and undisciplined, hence our creation is undirected and incoherent. If we embrace our creative power and consciously master our thoughts, we will begin to create coherently. And then it will become obvious that we are indeed creating our reality and we’ll begin to create the life of our dreams, and collectively the world of our dreams. Check out my article Are You Creating Your Reality? Manifesting 101 to learn more about conscious creation, often called manifesting. All that is — the galaxies, stars, planets, light, matter, you and me — everything we can see, and everything we can’t see are the inner workings of the cosmic mind — the universe is conscious in its very fabric, and we are inside of it! This consciousness, in fact, encompasses many universes and a vast number of parallel realities. It is the source of all that is, including our own consciousness and that of every sentient entity in the universe. We exist in a mindscape, a realm of ideas made manifest. We exist inside of a cosmic mind that is creating a multitude of environments and experiences to explore all the possibilities of existence and expand its understanding of self. It is all constructions of thought within the cosmic mind. You are a construct we call a person, and you are within a construct that we call the universe and the world. You are a vehicle that source consciousness is experiencing through. You are an aperture that it is using to look out onto, and experience, one of the many environments that it has created. You are a focal point of source consciousness’s awareness looking out from inside of one of its own thoughts and experiencing them. Through its thoughts, it is forming a multitude of parallel realities, and then diving in and exploring them, experiencing them. All realities, all worlds, are INNER WORLDS. This why it is said that to know thyself and know the truth you only need to GO WITHIN. Everything is within the unbounded mind of source consciousness, and it is all within you because you are it. You are a thought within a thought within a thought experiencing itself. The universe is infinite simply because it is a conceptual space, a realm of ideas and imagination, which makes it inherently unbounded. What it can create is only limited by its imagination, and it’s imagination is limitless. Each and everyone one of us is a part of this infinite mind, and we all potentially wield its unlimited creative power because we are it. The only thing that limits us is our beliefs and imagination! Wake up to what you truly are and be amazed at what you can create.